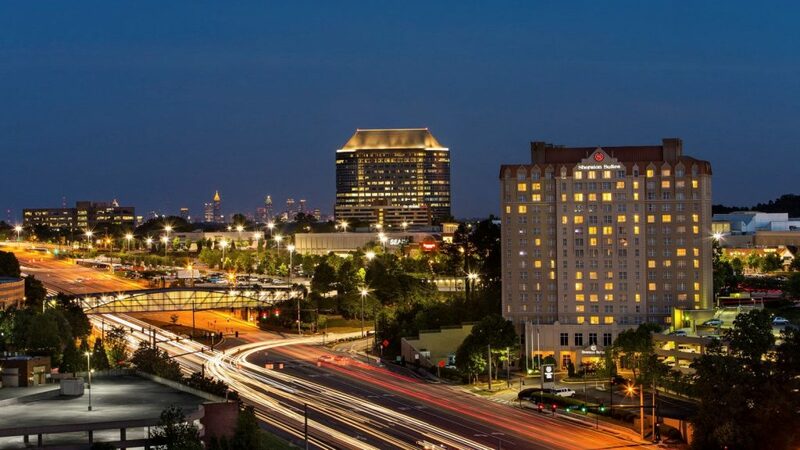 Embassy Suites by Hilton Atlanta Galleria is conveniently located six blocks from the Cobb Galleria Centre where you can admire city views from our Downtown Atlanta hotel. Ride our complimentary shuttle to attractions within a 3-mile radius. Free made-to-order breakfast buffet and complimentary evening reception. On-site E’terie Restaurant and Lounge. Parking $12 per day. Individual Guest Room Deposit and Cancellation Policies: A credit card is required to guarantee all guest room reservations. All arriving guests must present a valid credit card upon check in. Room, taxes, fees and a $50 per suite per night booked will be authorized against the card. Cancellation policies are located on the hotel website. Situated just steps from Cobb Galleria Centre and Cumberland Mall, Sheraton Suites Galleria – Atlanta offers a chic, all-suites, boutique hotel experience. Our spacious accommodations feature Sheraton Signature Beds, a sleeper sofa, a wet bar, microwave and mini refrigerator. Treat yourself to the breakfast buffet or a delicious dinner at The Grill, our onsite restaurant. Stop by for cocktails and appetizers at Martini’s Bar. Take our complimentary local shuttle to Sun Trust Park and The Battery Atlanta. Let our Atlanta hotel be your home base. Individual Guest Room Deposit and Cancellation Policies: A credit card is required to guarantee all guest room reservations. On Wednesday, March 27, 2019 all reservations for which a deposit has not already been collected will be charged a non-refundable deposit of two nights’ room and tax. Should any reservations be canceled after 11:59pm central time on Tuesday, March 26, 2019, the deposit will be forfeited and not returned. All reservations are subject to an early departure fee of one night’s room and tax if a guest checks out prior to the confirmed checkout date. The Atlanta Waverly hotel could not be better connected to the city’s best business facilities. 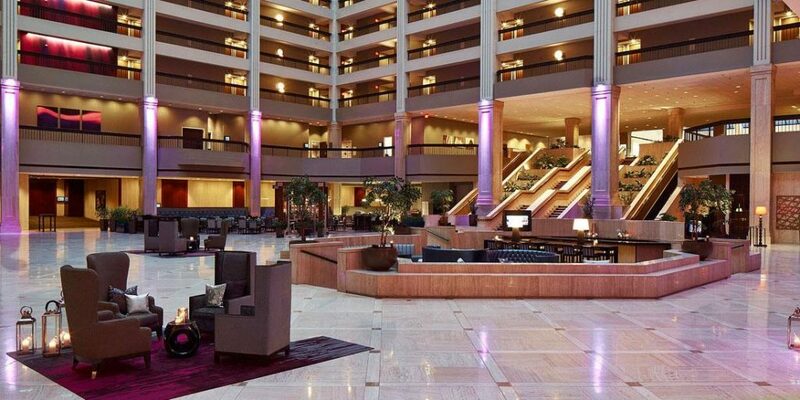 The hotel’s dramatic 14-story atrium leads directly into the Cobb Galleria Centre and its incredible 320,000 square feet of flexible meeting space. If you’d rather work in solitude, our superior, oversized rooms are hooked up with high-speed Internet and all the modern conveniences you could desire. Take a break by chowing down on some crab cake sandwiches at our popular Tosca Blue Bar. We’re also within walking distance of SunTrust Park – the new home of Major League Baseball’s Atlanta Braves – and the surrounding Battery Atlanta with many dining and entertainment options.